General rule says that designing your own ring will cost a tad more than buying per-designed rings. Other than that there are a number of things to consider. For instance would you like to splurge more money on the diamonds, and keep aside less for the metal; factor in the cost of the engagement ring, or also choose a diamond setting, whether you’d want it elaborate or simple. The next big question is whether to approach on-line jewelery retailers that allow customization or go for a boutique? If you are choosing Internet retailers, be wary of only buying rings from the most trusted brands because customizing on-line means you are not going to see the metal or the diamond physically, and chances of defaulting are higher. In comparison to this, in boutiques one can choose all the components of the ring by physically inspecting them. The main aim of customizing a ring is to make it more special for the person receiving it and for this, it’s important to know their tastes and preferences. Any fault in the design can actually disappoint your partner for a lifetime. For instance, if your girl is craving to receive a fancy two carat solitaire ring, and you design for her something much simpler, be prepared for a disappointed reaction from her. Selecting the metal will be determined by your budget. You can choose the most expensive metal options in the form of platinum, or choose mid-range white gold and yellow gold, or the least expensive titanium. Platinum and gold can be given intricate designs, but titanium, the least expensive metals, is not so flexible, and the design range remains limited. Selecting the diamonds is determined by the knowledge of the 4Cs of diamonds which is cut, clarity, and color and carat weight. These are the four things that will determine the quality, brilliance and the price of the diamonds. A larger stone may have higher carat weight, but also have more imperfection, and less clarity, which will bring its cost down. Once the metal, the diamonds and the stone for the ring have been selected, it’s time to have them put in a design. 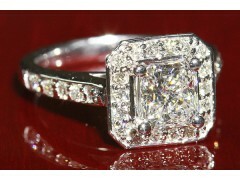 Both on-line as well as off line retailers these days use advanced software to generate ring engagement ring designs. On-line, you can select the metal, setting, and diamonds, and the software will assemble a number of designs for you, which you can keep changing to your liking. Similarly, at boutiques a person will enter your requirements into the software to generate the designs. The above exercise is an elaborate one, and will be an expensive investment. Therefore, to remain on the safer side, always sign agreements and documents before making the payment. In case, the final ring is not similar to the design, you can always return it provided you have the right documents with you.